The original of this picture is in the Epilepsy Museum in Kork. The legends of two martyrs are combined in the figure of Saint Anastasia (Greek: the risen one): Anastasia of Sirmium (Croatia) and Anastasia, the Roman. Both are said to have died in the year 304. The church celebrates the Roman saint's day on December 25th. Anastasia's name was included in the canon of masses in the 3rd mass on Christmas Day, the Shepherd's Mass. People pray to the saint for help with illnesses of the chest, but especially with illnesses of the head (also epilepsy). Anastasia, the Roman, was the daughter of the imperial administrative official Praetextatus and his Christian wife Flavia. After her mother's early death, Anastasia was brought up by the Christian Chrysogomus. She was forced to marry the high-ranking but immoral heathen Publius against her will, but she was able to remain chaste. In spite of her husband's brutal objections, she took care of Christians in Roman prisons. After Publius' death, she escaped the pursuits of the Roman house owner and accompanied her Christian teacher Chrysogomus to Aquileia, where, together with 200 virgins, whom they had converted, she died a martyr's death. Anastasia is portrayed with the sign of her martyrdom, she was chained and burned at the stake. In most pictures, as in this one, she holds a pair of scissors in her hands - a symbol of manly power which can cut through the life thread. This attribute is the reason why she is today the patron saint of journalism, which does not want its work to be influenced, or 'cut' from outside (freedom of the press). 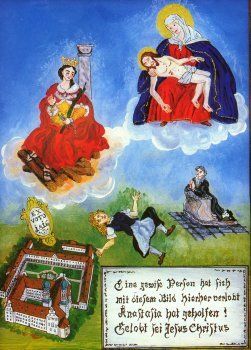 This picture, which was copied in 1980 from a votive tablet from the year 1816, shows Saint Anastasia as the patron saint of Benediktbeuren, where her relicts have lain since 1736. The colourful picture shows the classic way in which votive tablets were divided up: at the top we see the heavenly power (here in the form of Pieta), in the centre, the advocate Anastasia, and at the bottom the kneeling supplicant, the monastery of Benediktbeuren and - almost in the centre of the picture - the sick girl in a convulsion.